Why Hasn’t The Underground Embraced The iPod? The history of underground film production has followed along the path of the consumerization of equipment – From 16mm film to 8mm to analog video to digital. However, the distribution of underground film has been very slow at adopting the same consumerist ways and means. While many modern underground filmmakers still wait for their films to be released on DVD by professional distributors, other filmmakers use the multitude of workable self-distribution methods that are available now that never were before. First, professional DVD production, while costly, isn’t completely out of reach for enterprising filmmakers. Then, there are two DVD-on-demand options available. Filmmakers can either offer their films through a company like IndieFlix or Amazon’s CreateSpace; or, adventurous souls can produce their own DVD-Rs and sell them on sites like Etsy. But, when it comes to the booming mobile technology field, it seems that most filmmakers are hesitant to explore that avenue of distribution. Sure, the golden prize for any filmmaker is still a theatrical release, followed by a DVD-only release, then free distribution via embeddable video sites like Vimeo, and in some rare cases, YouTube. Each step down the rung of that distribution ladder feels like a gradual defeat for the filmmaker, especially ones looking to make money back for investors. Mobile film distribution is guided pretty much entirely by iTunes. Mainly that’s because that’s the only way to make any money from a film released in the mobile market. 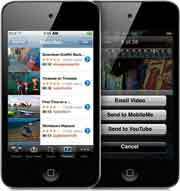 However, the reality is that any video will play on an iPod or an iPhone as long as its been encoded properly. However, as self-distribution methods are becoming more prevalent, intricate and unique, it’s about time we all start throwing mobile into the mix. And, yes, I mean “we” including myself. No, I’m not a filmmaker, but in my own ways of trying to promote underground films, I’m trying to think more mobile-oriented. Although not totally mobile-related, one of the reasons I recently redesigned Underground Film Journal’s Underground Films List to be more graphic-based came from playing around with the iPad — in the store, I don’t have one — and realized I need to think about appealing to the touch-screen based audience that’s out there. Anyway, back to films, whether they’re features or shorts, I think offering a mobile format along with other self-distributed formats is a good idea, particularly to ensure films can be viewed on as many platforms as possible. For example, I’ve seen a few filmmakers this week embrace the webisode format, whether it’s for a completed series, a cut-up film or as individual promo videos for a longer work. These filmmakers all took the same format: Uploading the films to Vimeo, then embedding them on their individual blogs/websites. Vimeo is a good choice for filmmakers thanks to the site’s high video quality. But, currently Vimeo videos don’t work on iPhones, although they do allow for a downloading workaround that still only streams the videos as long as you’re on a Vimeo webpage — and, that is, if filmmakers allow for that option. If that’s the distribution route one is going, then it can’t hurt to offer downloads on individual websites. Of course, one problem with that is that if a particular film or web series gets popular, a lot of visitors downloading videos might cost considerable bandwidth. But, many web hosts offer reasonable download rates these days. Or, another option is to simply link to the Vimeo download on your own personal blog or promotional website. I’m not quite sure what the answer is, but the questions need to start being asked and examples tried out. Like the old days of underground film when filmmakers explored their format limitations in creative ways –visible link splices and scratches didn’t hold many of them back — it might also be a good idea for filmmakers to start creating work specifically for the iPod. Speaking just for myself, I’m a format agnostic. I think a film should work when played / screened at any size. Screen size, location and surroundings do have an impact on audience reception to a film, but a great film — or even just a good one — should offer similar entertainment and artistic enjoyment despite format. Maybe I’m just writing all of this out of consumer frustration. I’m itching to watch great underground films on my own iPod Touch and it’s confounding trying to find stuff. But, if I’m out there digging around, maybe others are, too. Marcos: Thanks for the tip! You always have a good one. If anybody knows of any other exceptions, even if it’s just to promote your own work, please leave a comment and a link. Inappropriate promotion will be deleted, but I’d like a genuine list of what’s out there that’s mobile-friendly. I think some of it might have to do with the whole art/commerce type of thing. An “artist” I know who went to Cal Arts told me that she would “NEVER” have any of her films for sale on a website – that is the kiss of death if you are a “true artist”, etc. Not that all underground filmmakers think of themselves as artists but maybe they are uneasy with having their films so accessible to the masses who may not understand their films so well in the first place. Charles: Good point. I think there’s a whole host of reasons for lack of mobile enthusiasm and that’s certainly one of them. And I think it’s a strange one. I got into that a little bit in the article above. Mobile devices are just another canvas on which to work on, so I don’t quite get why it’s perceived as being inferior. It’s just different, not lesser. Personally, even though I’d like to make money off of my films I know it is incredibly tough. Especially for a short filmmaker like myself. I’d rather just have a normal job and make the films I want to make without worry if I can make ends meet. I feel worrying about that paycheck tends to compromise vision…unless you have LOTS of money. Since I am still trying to make a name for myself, I aim to put my work online AND send to festivals. I feel the festivals will give your film a platform and give it an air of legitimacy compared so something just playing online. I thought about exploring the options of submitting my work to hulu, itunes, etc but I think I’m going to keep my films close to the chest…at least for now. I think what Brian says is the key here. You submit to a good fest like CUFF and hope they understand your vision. If you get it played and promoted (ha!) at a good underground festival then you feel the “right” audience is viewing it. There is nothing worse than showing “Westsider” to an audience consisting of suburbia-dwelling relatives who just stare at my film blankly, not understanding any of the concepts presented. Maybe it’s reactions like that that underground filmmakers want to avoid. Kind of like hunting for that rare punk 45 in a cool alternative record shop. Now, all that said, I do plan on getting my films sold thru Create Space very soon so I will go the route you speak of. That’s true about fests conjuring an air of respectability around a film, though I don’t think I necessarily agree with that system as it leads to certain fests lending certain respectability to certain films. I just wish things were more open, and that includes not thinking that an iPod release is part of some kind of walk of shame. It can be used properly as a good promotional tool. I don’t really buy the whole thing that making your work available to the public is the kiss of death. As underground filmmakers we create alternatives to mainstream entertainment. Those alternatives should be available to the public, even if the audience isn’t necessarily a wide one. I certainly don’t sell tons of my movies on my etsy site, but when I do the people who buy them get pretty excited that stuff like this exists. And, speaking of iPods, there are some pretty cool little battery run projectors out there which take the iPod’s signal. You can easily have an imrpomptu underground film screening anywhere. Happy culture jamming!